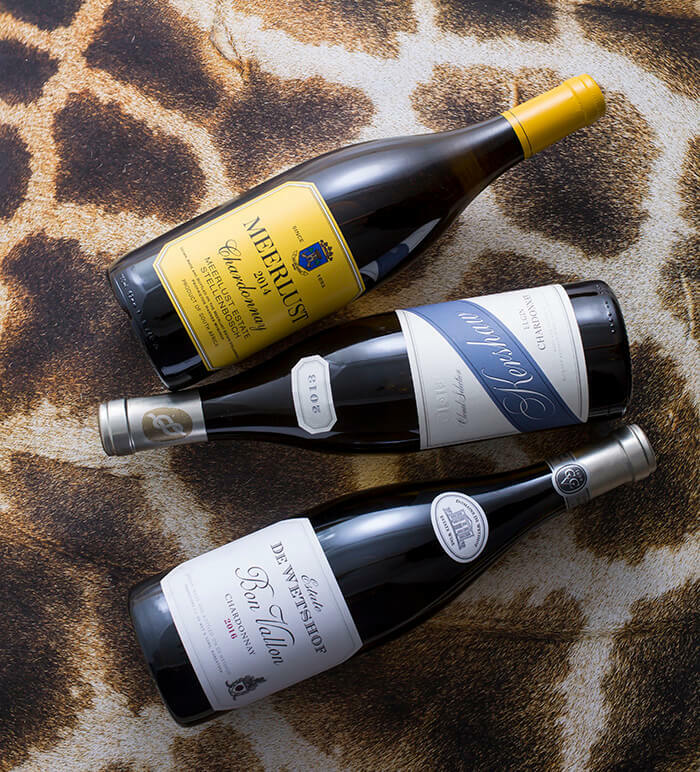 South Africa’s white wines tell the story of their diverse regions. Learn terroir tips and what you should keep an eye out for from this unique place. From sparkling and dry wines to fortified and dessert-style selections, South Africa’s winemakers produce a wide range of styles from a vast array of grape varieties. But think “South African wine,” and you’re likely to conjure ideas of a lush, smoky Pinotage, a flavorful Cape blend or, possibly, a spicy Syrah. Unfortunately, it’s not common for a white wine to be top of mind. But there’s a world of white-wine wonder just waiting to be explored, from terroir-driven Chardonnays and pristine Chenin Blancs, to refreshing Sauvignon Blancs and much more. Since these underappreciated bottlings fly under the radar of many wine lovers, they’re priced reasonably relative to other quality whites from around the world. Beat the rush: Snap them up before South Africa becomes synonymous with extraordinary white wines. Chardonnay is planted in almost every major wine-producing country. It can be produced in a range of styles, from lean and unoaked to ripe and rich. It can even express a range of presumably terroir-influenced elements, from stony minerality to salinity and even herbal tones. The Robertson WO (Wine of Origin): Soils high in limestone and clay assist in water retention. Together, these factors result in slow, steady ripening and high natural acidity. As a result, Chardonnay often yields wines that speak volumes of terroir. And many consider the greatest examples to be those that best express their sense of place. Robertson is one of the top appellations (called a WO, or “Wine of Origin”) for Chardonnay in South Africa. Conditions in the region are characterized by cold winters and dry, sunny summers, while cool afternoon breezes from the Agulhas coast deliver significant day-night temperature shifts. Soils high in limestone and clay assist in water retention. Together, these factors result in slow, steady ripening and high natural acidity. “We have six different Chards, each with its own personality and style dictated by the site it stands on,” says De Wet. Approximately 40 miles southeast of Cape Town is Elgin, a cool-climate WO nestled in the Hottentots-Holland Mountains, at elevations between 820–1,300 feet above sea level. Elgin was traditionally an apple-farming region and is situated fewer than 10 miles away from the South Atlantic Ocean. Today, it’s also home to benchmark Chardonnay producers Iona, Lothian, Paul Cluver and Richard Kershaw Wines. All produce elegant expressions of great balance and freshness, marked by white-fruit flavors. “At the end of the day, each vintage—and, importantly, in a cool climate like Elgin, there is noticeable vintage variation—will tell a story, so the wine should reflect that vintage, rather than simply let winemaking practices alter the wine in order to chase a style,” says Richard Kershaw, MW. Kershaw 2013 Clonal Selection (Elgin); $60, 92 points. Meridian Prime Inc.
Meerlust 2014 (Stellenbosch); $23, 92 points. Maisons Marques & Domaines USA. Editors’ Choice. Capensis 2014 (Western Cape); $80, 91 points. Sovereign Wine Imports. De Wetshof 2016 Bon Vallon (Robertson); $20, 91 points. Broadbent Selections, Inc. Editors’ Choice. Hamilton Russell 2015 (Hemel en Aarde); $34, 91 points. Vineyard Brands. Thelema 2014 (Stellenbosch); $25, 91 points. Cape Ardor LLC. Fynbos: The Afrikaans term for the natural shrubs and vegetation that stretch across the Western Cape which adds a distinctly South African character to the bouquet. Chenin was traditionally known as a workhorse variety, thanks to vigorous, high-yielding vines suitable to a variety of climate conditions and soil types. But today, the focus has shifted from volume to quality, with the aim of producing complex, site-expressive wines. Chenin’s bright aromas and flavors can range from tart apple, green plum and lime to more robust notes of ripe stone or tropical fruit, melon and clementine, always framed by lifting acidity. There can also be hints of slate, chalk and flint, as well as lively herbal or floral characters. Those include nuances of fynbos, the Afrikaans term for the natural shrubs and vegetation that stretch across the Western Cape, which adds a distinctly South African character to the bouquet. Oak influence can range from nonexistent to moderate levels, although current fashion is to allow the grape to speak louder than any wood. The 2015 vintage is largely regaled as a Goldilocks vintage, where everything seemed just right, and its wines will stand the test of time. The 2016 growing season was more difficult, as drought and heat will likely result in wines that will be more accessible upon release. Here’s your early report on 2017. Swartland is home to many of the country’s oldest vines, especially Chenin. Old bush vines whose yields have been controlled are said to produce the most intensely flavored selections and best express their terroir. In the Swartland, that can include quartz- or granite-based soils. “The Swartland is the best for the character that we are looking for in Chenin, which is dry but full, due to the slightly lower acids of our area, concentration of flavors from the old vines and the ability to do natural fermentations because there is very little disease pressure,” says Andrea Mullineux, winemaker for Mullineux & Leeu Family Wines and recipient of Wine Enthusiast’s 2016 Wine Star Award for Winemaker of the Year. Stellenbosch is another key region for Chenin, where the wines often boast both palate concentration and great freshness. Mullineux 2014 Granite (Swartland); $88, 93 points. Kysela Père et Fils. Beaumont 2015 Hope Marguerite (Bot River); $40, 92 points. Broadbent Selections, Inc.
DeMorgenzon 2015 Reserve (Stellenbosch); $35, 92 points. Cape Classics. Remhoogte 2014 Reserve Honeybunch (Simonsberg-Stellenbosch); $24, 91 points. Invoer Ekke LLC. Editors’ Choice. Bellingham 2015 The Bernard Series Old Vine (Coastal Region); $25, 90 points. Pacific Highway Wines & Spirits. Simonsig 2015 Chenin Avec Chêne Wooded (Stellenbosch); $36, 90 points. Quintessential Wines. Grown around the globe, Sauvignon Blanc is often a wallet-friendly and easy-to-find option for consumers who enjoy accessible and refreshing dry white wines. Its characteristics can vary based on the climate in which it was produced. But generally, it yields a clean quaff, with bright fruit and citrus notes as well as refreshing acidity. In cool areas, aromas and flavors of green fruits, grass, herbs and bell peppers may prevail, while warm climes tend to result in wines of greater lushness and concentration, with stone- and tropical-fruit tones. Many Sauvignon Blancs from South Africa combine herbaceous notes and rich fruit. Their harmony and approachable nature have increased demand for the country’s bottlings, which has also lead to increased plantings. In 2015, it accounted for 9.4 percent of South Africa’s total grape acreage, up from 7.5 percent in 2005. Sauvignon Blanc: In cool areas, aromas and flavors of green fruits, grass, herbs and bell peppers may prevail, while warm climes tend to result in wines of greater lushness and concentration, with stone- and tropical-fruit tones. Beyond balance, a distinctive thread for South African “Sauvy” is a prevalent fynbos character that matches the grape’s already aromatic nature. It corresponds with the grape’s inherent herbaceous nature and complements the fruity elements. “Sauvignon Blanc in the Cape does best with a cool climate to allow slow ripening, but also rich fertile soils, resulting in high vigor, huge foliage and low yields, which tend to produce expressive and body-rich wines,” says Lars Maack, Buitenverwachting’s managing director. Coastal influences and cooling breezes are key for many producers, especially when warm or dry seasons strike. “Generally, we are blessed with cool summer winds coming off the cold False Bay water, which lies to the southeast of our site. [Those winds] are essential for the slow ripening and aroma production of Sauvignon Blanc,” says Paton, who says that the breezes also help keep humidity out of the vineyards, which can ultimately lead to mildew or rot. Sauvy’s future is still bright. It’s a cultivar able to produce more than people might expect, which South Africa’s winemakers are happy to prove. Buitenverwachting 2016 Bayten (Constantia); $15, 90 points. Cape Classics. Best Buy. Neethlingshof 2015 (Stellenbosch); $14, 90 points. Saranty Imports. Best Buy. Spier 2016 Vintage Selection (Coastal Region); $17, 90 points. Saranty Imports. Editors’ Choice. Vergelegen 2015 (Stellenbosch); $22, 90 points. Black Hawk Imports. Warwick 2015 Professor Black (Coastal Region); $23, 90 points. Broadbent Selections, Inc.
Tokara 2015 (Western Cape); $17, 89 points. ­Dreyfus, Ashby & Co.
A historic grape, especially in areas where the Huguenots settled, Sémillon once dominated the country’s production. It peaked in 1822, when it covered 93 percent of total vineyard plantings. By the 1970s, that number fell to 3 percent. Today, the grape is enjoying a bit of a renaissance, as winemakers produce high-quality, long-lived bottlings. Notable producers include Alheit and Boekenhoutskloof, both from Franschhoek. This aromatic grape does well in cool climates of South Africa, like Robertson, and high-elevation spots within the Coastal Region, where Viognier can achieve ripe—but not overripe—fruit flavors while maintaining some natural acidity. The grape’s floral characters play well with the herbal tones that South Africa’s natural vegetation can impart. Notable producers include Noble Hill and Diemersfontein. Although there are plenty of single-variety successes in South Africa, there’s a range of white blends that carry the same stuffing. Pay close attention to Chenin Blanc-based blends—currently the darling of South African winemakers—but also Bordeaux-style white blends of Sauvignon Blanc and Sémillon, which showcase a seamless interplay between bright fruit and spicy, textured richness. Notable blends include Cape Point Vineyards’ Isliedh and Avondale’s Cyclus.